Just back and catching up on everything. I’m making my way through 248 emails, after I weeded out the spam. I’m working on this little 17′ roto molded beach trimaran. It is intended for resorts. I had not yet seen the updated website for the 65′ , 100 passenger Alii Nui. This KHSD charter cat was built in foam/glass by Schooner Creek. Includes Seattle, Portland, and San Diego. Its not on a web page so you have to call in or email to get the list of items. Some great prices on overstock and ends. One of the perks of the job is getting a visit from sailors of KHSD boats who rave about the boat. Brian Bell and crew stopped by today. Based in New Zealand, their cruising ground is the South Pacific. Somebody has to do it. Beautiful boat. I will be out of the office Feb. 19 through 26. I might not even have email. 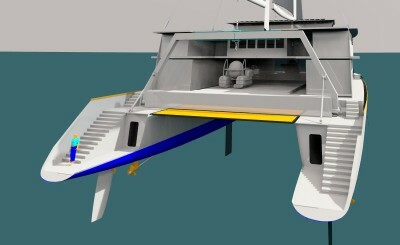 The 50m oceanography catamaran design keeps going on. It has become a black hole for time. I think I can pull off of it for a while now. It does look pretty cool. Congratulations. The guys and a girl, Team Hallin, the trimaran rowing team using KHSD hull lines just arrived in Barbados to set a new world record across the Atlantic. See the arrival webcam at http://www.portstcharles.com/webcam_window.php?cam=3. And http://www.teamhallin.co.uk/wp/ for the announcement. I’ve had my head down..
For everybody who expected design work last week and didn’t see it. Here is why. I had my head down rushing to get this 50 meter sailing oceanography research vessel modeled. Client is Windhorse Lightships L3C. 65' passenger ferry for Lake Victoria. Looks pretty good. Carbon chainplates sound good for marketing, but E-glass is just as good. Here is why. 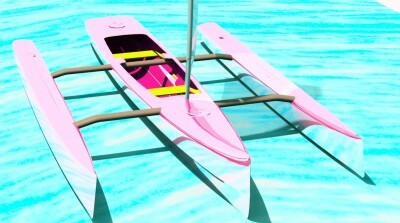 Imagine a 30 trimaran that weighs say 2000 lbs. The chain plate vertical load at overturning will be about 1000 lbs. Add in vector of shroud angle and crew and lets say a static plate load of 2000 lbs. Hand layup and vacuum bagged carbon uni should have a tensile strength of some 80,000 to 120,000 psi depending. That means a chainplate of 1/35″ or 0.7mm. Now, tensile is not the only load, but for now assume it governs. Double it for grins and put one at each end of a rod or something. Even at 1/15″ (1.6mm) it looks way too weak to most of us. Most of us do not have an instinctive feel for how much carbon looks right. Most of us would only be comfortable if the thicknesses look to be at least what Skenes would require in stainless. That gives dozens of safety factors just to get it to look right. E-glass uni will not be that much less tensile strength than the carbon uni. Expect maybe 60,000 to 70,000 psi tensile strength. So even with e-glass you will still have a safety factor of dozens. 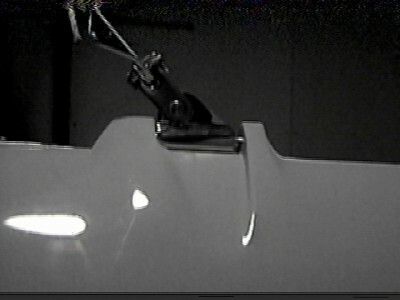 Carbon fiber does have better than twice the fatigue resistance, but the safety factors are so many, it doesn’t matter. E-glass does provide better shock absorbing, theoretically. Its stretch to failure of around 6%, combined with the same from the resin, should help absorb shock. The only problem is that with a safety factor of 20 or so, the e-glass won’t give anyway. Its not loaded enough to give. Carbon fiber is fun for this job, but not at all necessary. I know, its heresy. I am working on an update to my article first published Spring of ’09? First, I can’t believe there is still a recession. I will be adding a few new cores and links. The best part about it was I got a call from Meade Gougeon in the summer of ’09 about the article. He thought is was the best thing he had read in years and it motivated him to get back into the building part again, as he told me. We talked at length about it at IBEX in ’09. Back in ’08 I submitted the article to Professional Boatbuilder. They told me that they were not interested in it. It seems that they don’t count owner-builders in their readers. I’m guessing I have close to 2000 builders over the years. I’m also guessing almost all of them read Pro Boat. Thats not nothing. I imagine my comparing product brands was the problem. I should have known that. The advertisers would not like it. The odd thing was that Pro Boat published a fine exortation to boatbuilders by Bob Lacovara in Feb/Mar 2010 called…PostApocalyptic Boat Building. They had my article there for months before that. How did that work? Oh well. Kind of low though. I just learned that two teams, each with a KHSD hull design, have set out to break the rowing record across the Atlantic. 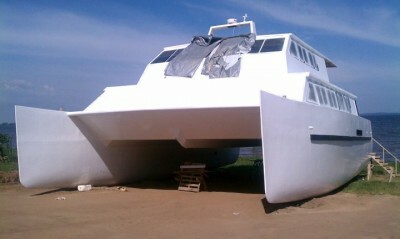 One is a catamaran and the other is a trimaran but both use the KHSD Formula 40 catamaran hull design. 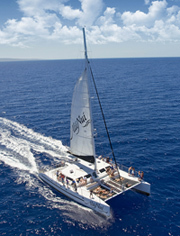 They are Team Hallin http://www.hallinmarine.com/team-hallin_2.htm and Big Blue http://www.rocexpedition.com/index.html. 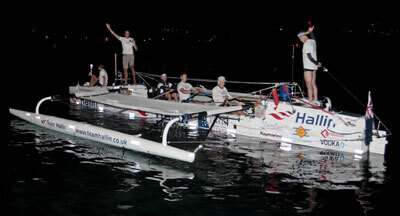 Team Hallin left Tenerife on Jan. 6th and is reported on track to set a new record. Blue left on Jan. 11.